Japan Airlines International Co., Ltd. (JAL) (株式会社日本航空インターナショナル, Kabushiki-gaisha Nihon Kōkū Intānashonaru? ), is an airline headquartered in Shinagawa, Tokyo, Japan. It is the flag carrier of Japan and its main hubs are Tokyo's Narita International Airport and Haneda Airport, as well as Nagoya's Chūbu Centrair International Airport and Osaka's Kansai International Airport. The airline and four of its subsidiaries (J-Air, JAL Express, JALways, and Japan Transocean Air) are members of the Oneworld airline alliance. JAL was established in 1951 and became the national airline of Japan in 1953. After over three decades of service and expansion, the airline was fully privatized in 1987. In 2002, the airline merged with Japan Air System, Japan's third-largest airline and became the sixth largest airline in the world by passengers carried. The airline filed for bankruptcy protection on January 19, 2010, after losses of nearly ¥100 billion in a single quarter. 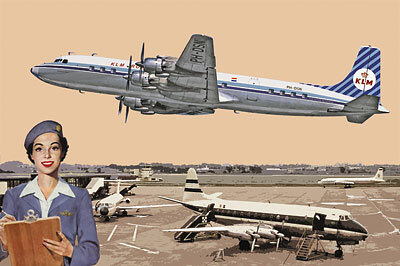 Japan Airlines used the Douglas DC 7C during the Nineteen fifties. 1 decal profile for a Japanese Airlines DC 7C. With this kit #303, the issues with pulling the sprues from the mold too early seem to have been some what arrested. There is no warping or distortion. The front nose area is clean without ripped edged issues. But there is still flash on the spine and at the rear trailing edges of the wing union on the fuselage. There is also a distortion on one of the wing tip lower surfaces. I believe this to be a sprue ejection from the mold issue. Though easily fixed by the modeler it may be something of a regular issue / fingerprint with this mold. DC-7C JA6301 "City of San Francisco", Japan Air Lines 1959. I am just guessing mind you but the other airline liveries that could possibly be coming down the road are; Aeromexico, Alitalia, American Airlines, BOAC, Braniff Airways, Caledonian Airways, Delta Air Lines, Eastern Air Lines, Japan Airlines, KLM, National Airlines, Northwest Orient, Panair do Brasil, Pan American World Airways, Sabena, SAS, South African Airways, Swissair, THY, TAI, and United Airlines. Highs: Decent engraving. Overall scale length and wing span appear very close to original type. Some of the complaints I had in the first issue seem to have been recified as this sprue has no warps. Lows: Cockpit windshield needs to be replaced with cut sections of sheet plastic or a sharp vacuformed version. More than an average clean up is needed. You are absolutely correct, my faux paux. I got the first issued kit review right. Must be my trifocals. I hate getting old. As suspected this kit will be released again with KLM Royal Dutch Airlines markings.